Writing Center Philosophy — Randall Sessler, Ph.D. I believe that writing centers are uniquely poised to make a profound impact on their institutions because they sit at a crossroads – a crucial liminal space – for students, faculty, and their own staff members. For students, writing centers sit between the beginning and end of writing opportunities. A cursory glance of writing center mission statements will show variations on a theme, with each essentially claiming to help all students with any form of writing at any stage of the writing process. While writing center practitioners recognize the value of essays, cover letters, research projects, dissertation proposals, and a myriad of other textual and digital genres, students may struggle to connect particular assignments with larger educational and professional goals. Therefore, when I introduce students to the services we offer, I ask them why they are taking a particular course. Once we get past the familiar “because it is a requirement” refrain, I ask students what their long-term goals are. Some tell me they are working to become the first member of their family to graduate with a bachelor’s degree; some say they want to set an example for their children and family members; and others say they want to improve their quality of life. By connecting the assignment and the course to these larger objectives, writing centers guide students towards a deeper understanding of the role that a local writing opportunity might play in their lives. The writing center emerges as an ally, a vital and vibrant one, standing ready to help them achieve their goals. For faculty members, writing centers reside between learning objectives and students. Over the course of my career, I have seen the ways in which four different writing centers interact with faculty members. Trust, mutual respect, and open lines of communication are absolutely vital; therefore, I actively seek out feedback from faculty in order to learn how to serve students even more effectively. When faculty members and writing center practitioners collaborate, no learning objective is too ambitious. For writing center staff, the position of writing tutor sits between educational goals and professional aspirations. Much is asked of writing tutors; however, I also invest in my team members the way that I ask them to invest in students. For example, at Wallace College, one my former peer tutors is a talented artist. Partnering with the head of the art department, the writing center hosted a special three-night interactive exhibit of her Miss Represented project. The event drew students from a variety of classes, faculty members from Troy University, and members of the general public. The engaging exhibit gave a young artist a new platform to showcase her work and allowed the center to connect with new constituents. In addition, former Wallace College peer tutors have continued their careers at writing centers at other institutions, including Auburn University, Auburn University at Montgomery, and the University of Montevallo. At Azusa Pacific, I use new media to introduce, or reintroduce, students, faculty, and administrators to the writing center. 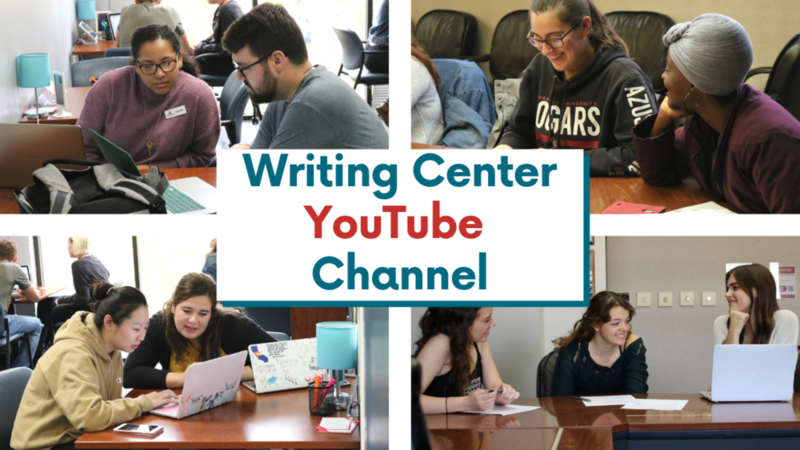 The center’s new YouTube Channel and active social media presence also, and perhaps most importantly, provide a visible and engaging space for tutors to showcase their work and individual personalities. I thoroughly enjoy collaborating with my team to bring their work to a larger audience and the improvement in team morale is palpable. While sitting at a crossroads can indeed be precarious, it is precisely this position that gives writing centers the opportunity to reach across departmental, disciplinary, and linguistic boundaries to help students develop their singular voices.